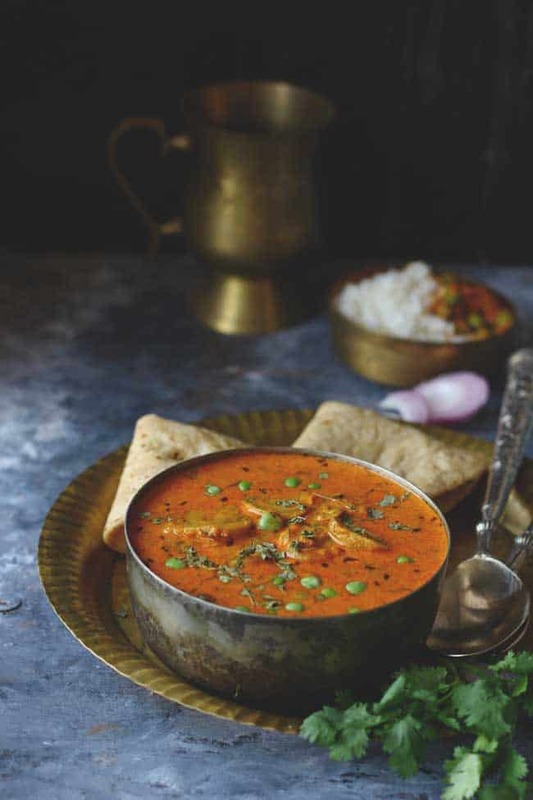 This delicious Recipe of Mushroom Masala with Gravy is easy to make, naturally gluten-free, and full of the most gratifying curry flavors that are sure to warm you up. One of my favorite meals of the week? This quick, easy, and oh-so-comforting Matar Mushroom Curry. Serve it with chapati or jeera rice, either way, it tastes super good. 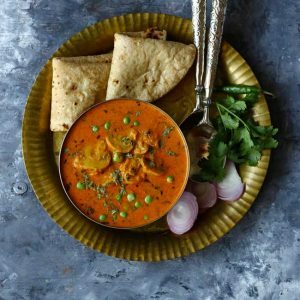 So if you’re looking for a fancy and comforting meal to share with some important people in your life this week, this delicious Matar Mushroom Masala Curry could be your favorite pick. It does not require a list of lavish ingredients. The trick to getting it right is in perfectly and patiently sauteeing the masala. If you are seeking a restaurant like Matar Mushroom Curry then at each step fry the masala till it starts leaving the sides of the pan. That is the only not-so-secret trick to make a classic curry. This Matar Mushroom Curry is easy to customize to your (and your guests’) preferred levels of heat. Throw in few green chilies for an increased level of heat. Love paneer (cottage cheese) more than mushroom? Feel free to substitute paneer, tofu in the same quantity or whatever sounds good. 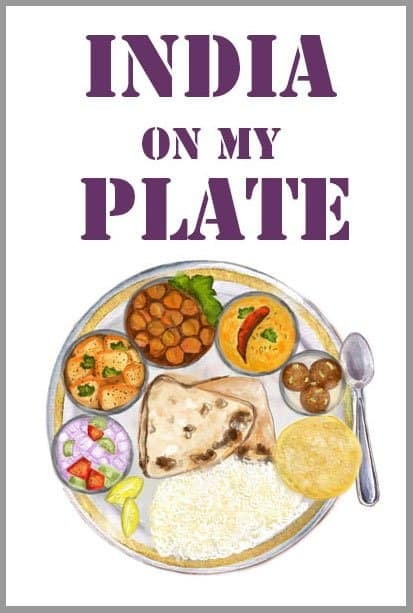 And it’s a wonderfully slow meal to sit and savor and enjoy, especially as you talk and listen and dip warm phulkas in the spicy curry or polish steamed rice with it. There are many variants of the Mushroom Curry but this one, in particular, is my favorite. The no-nonsense attitude of this curry is one thing that brings me back to it again and again. Tempted enough? 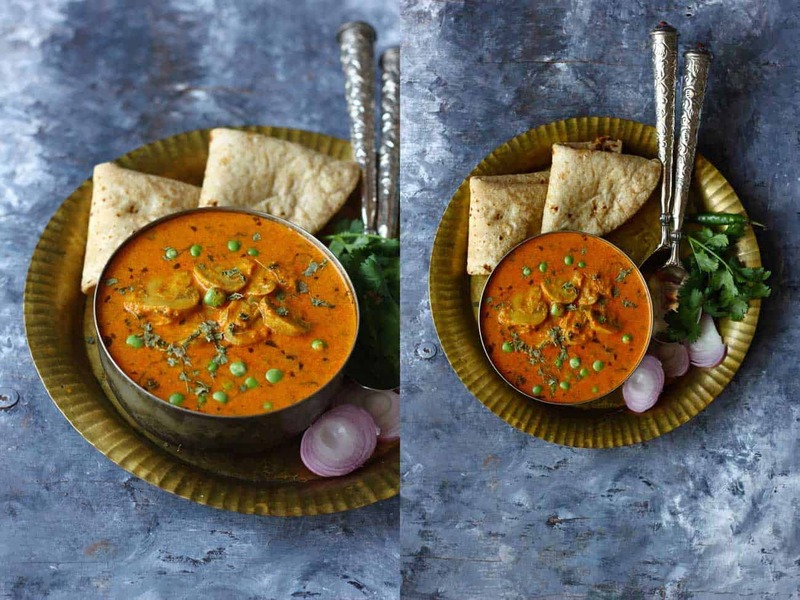 Now try this Easy Matar Mushroom Masala Recipe and let us know how it turned out. 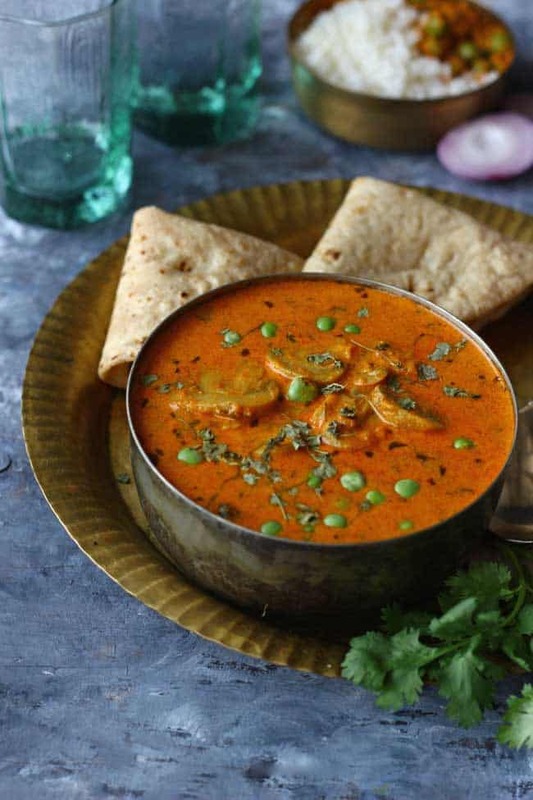 If you are a curry lover then stay connected with us on Instagram. Reason? 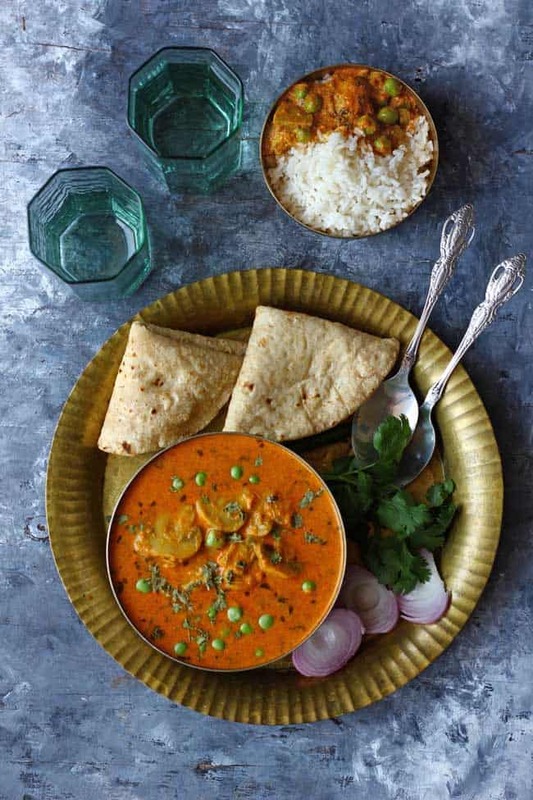 we are hosting a series of curries from across the nation on our Instagram profile (@funfoodandfrolic). So for anyone else who hasn’t discovered us yet on Instagram, just wanted to share the news! Cheers! This is a quick, easy, and oh-so-comforting Matar Mushroom Masala Recipe. Serve it with chapati or jeera rice, either way, it tastes delicious. Wash, clean and slice the mushrooms. Set aside. Use food processor or blender ( buy it here ) to chop the tomatoes into a chunky paste. Heat oil in a kadhai ( buy it here ) till it reaches the smoking point, reduce the heat to low. Add bay leaf followed by chopped onion. Saute till the onions turn golden brown in colour. Add the ginger-garlic paste, mix well and cook for 2 - 3 minutes on a medium flame. Add the chopped tomato and cook the masala over low heat till it starts leaving the sides of the pan. Stir at regular intervals for even cooking. Now add tomato puree, chilli powder, coriander seeds powder, turmeric powder, garam masala ( see recipe ) and salt. Add a tablespoon of water if the masala is sticking to the pan. Cook till the oil separates from the masala. Add the green peas and mushrooms. Stir to combine. Cook for a minute or till the mushroom soften a bit. To make gravy, add a cup of warm water and simmer the curry covered for 10 - 15 minutes or till the vegetables are cooked. Serve Matar Mushroom Masala garnished with coriander leaves. Thank you so much. Glad you liked it.